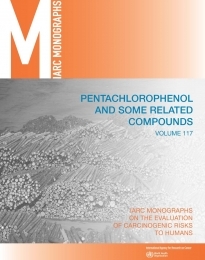 This volume of the IARC Monographs provides evaluations of the carcinogenicity of pentachlorophenol, 2,4,6-trichlorophenol, 3,3′,4,4′-tetrachloroazobenzene, aldrin, and dieldrin. Pentachlorophenol, aldrin, and dieldrin are classified as persistent organic pollutants under the Stockholm Convention. Pentachlorophenol has been widely used as a wood preservative and insecticide, but its production and use are now restricted. 2,4,6-Trichlorophenol has also been used as a wood preservative and insecticide, and in the synthesis of some fungicides. Aldrin and dieldrin are synthetic organochlorine pesticides used as broad-spectrum soil insecticides for the protection of various food crops, as seed dressings, and to control infestations of pests such as ants and termites. In several countries their use has been banned or severely restricted since the early 1970s. 3,3′,4,4′-Tetrachloroazobenzene is not manufactured commercially but is formed during the production and degradation of chloroanilide herbicides such as propanil, linuron, and diuron. Exposure to all five agents considered may occur in the general population as well as in various occupational settings. An IARC Monographs Working Group reviewed epidemiological evidence, animal bioassays, and mechanistic and other relevant data to reach conclusions as to the carcinogenic hazard to humans of environmental or occupational exposure of these agents.